Forget the canned stuff. This is way better! 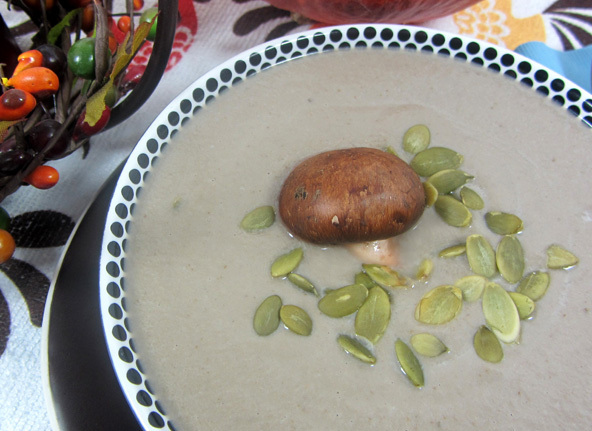 Looking for a great replacement for canned Cream of Mushroom Soup? Well here it is. And get this, it is thickened with a super healthy ingredient: Chia seeds, ground to a powder. It’s amazing and so good for you. Cream of Mushroom Soup, condensed in a can has been an American family staple for decades. I know I grew up on it. Opening up a can of this stuff is so easy that it found its way into tons of recipes. But have you read the ingredients? Besides water and mushrooms it has corn, cottonseed, canola and/or soybean oil (all refined oils), modified food starch (highly refined starch), wheat flour (that’s white refined flour), salt (870 mg per 1/2 cup), monosodium glutamate (MSG is addictive and causes triple the amount of insulin, causing rats and humans to become obese), soy protein concentrate, yeast extract, flavoring (who knows what kind). You can avoid all the processed junk (especially the MSG, yikes!) and simply make your own whole food nutritious version with this recipe. It’s easy. You can even make this a head of time and double or triple the recipe and freeze it to have it easily accessible to replace the canned stuff. Oh and did I mention that it tastes wonderful? In a medium saucepan over medium heat, sauté onions with the coconut oil for about 5 minutes. Add the mushrooms, vegetable broth, garlic and seasonings and let cook another five minutes or so with a lid on. Add the coconut milk. If it is frozen it will help cool the mixture down in preparation for blending it in the blender. Very carefully pour the mixture into a blender. Place the lid on the blender and slowly blend until smooth or use an immersion blender while in the saucepan. To thicken up the soup, blend the chia seeds into a powder in a small coffee grinder not used for coffee grinding. Then add the chia seeds into the blender and blend until smooth. Add additional chia seed powder if you want it thicker. Use ¼ an onion instead of a whole one. Blend all ingredients in a blender and blend to desired consistency. Warm up to 118 degrees and serve. Mushrooms are the only known plant food source of vitamin D. Animal sources highest in this vitamin are Cod Liver Oil, Herring, Salmon, Makerel, Sardines and Tuna. We get Vitamin D3 from the sun but if you’re indoors a lot or it’s winter, you definitely need to be aware of getting enough of this immune supporting and likely cancer preventing, super important vitamin. Mushrooms also have B vitamins, selenium, ergothioneine (an anti-oxidant), copper, potassium and beta-glutcan (immunity stimulating). So think of mushrooms often. According to WebMD we need 400 IU of vitamin D per day from our food unless you’re spending 20 plus minutes a day with sun exposure to your skin. Read more at WebMD to find out how much more you may want to be getting. 3 oz of mushrooms provide 400 IU’s of Vitamin D. That’s approximately 4 white button mushrooms. Put them in salads, soups, sauces and stir-frys often. Taking over 50,000 IU’s of vitamin D per day will cause toxicity which is next to impossible to happen from food nor sunlight, but can from over-dosing on supplements. 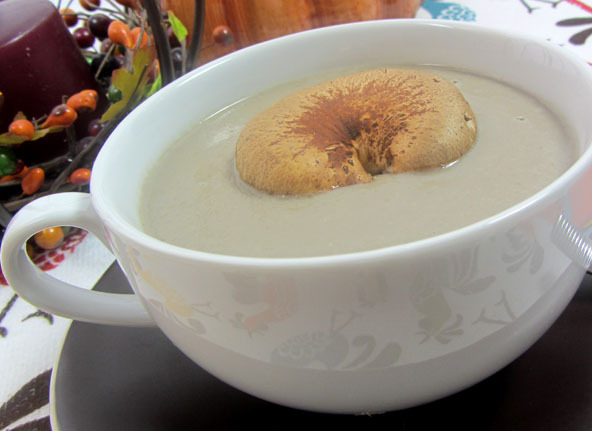 Follow the recipe for the Cream of Mushroom Soup and add the second Tbsp of chia seeds, powered for extra thickness. 1 cup of parsley, diced. Cook potatoes in a separate pan over medium heat with 1 cup vegetable broth until the potatoes are soft enough to pierce with a fork. Cook optional ground beef. I like to have pre-cooked ground beef in the freezer to conveniently add to dishes like this. 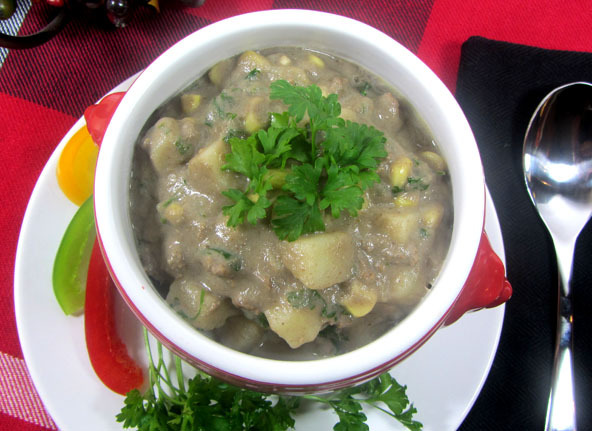 Add the cooked potatoes, frozen corn and fresh parsley to the already prepared cream of mushroom soup. Serve warm.